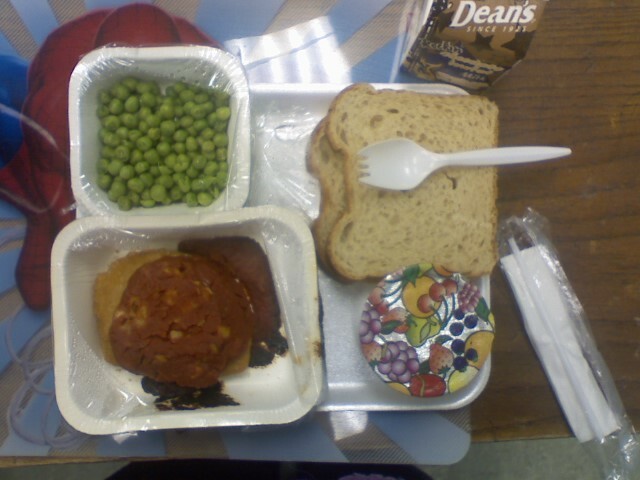 Today’s menu: Chicken patty with peas, two slices of bread, fruit cup, and chocolate milk. There was sauce on the patty. I guess it was tomato sauce, but it was tasteless and of course you can see that it was burnt. The fruit cup was partially frozen. In fact I stabbed it with my spork. I ate up the chicken, the bread, and the peas. Sometimes they offer butter with the bread, but I didn’t see it there this time. Of course the kids don’t get knifes so spreading the butter on the bread is a challenge. Basically you have to smear it.